The liver must filter all the chemicals found in cigarette smoke, so if you smoke, there’s no time like the present to kick the habit for good. Onions contains sulfur that is required to increase enzyme activity that, in turn, boosts liver cleansing. Without adequate levels of sulfur, the phase 2 of liver detoxification cannot keep pace with level 1, meaning that many toxins can become more dangerous in your body. By adding onions to your soups, salads and sandwiches, you’ll add flavor and bolster your meal’s liver-healing power at the same time. While you may enjoy a drink now and then, your liver must process all the alcohol you drink. An occasional drink is fairly harmless (unless you already have impaired liver function), but more than that puts undue burden on your liver. Drugs like acetaminophen have been linked with liver damage. That doesn’t mean you have to needlessly suffer as there are many great natural pain relievers available, including the Brazilian rainforest essential oil known as copaiba, which contains a highly potent naturally-occurring pain-killing substance called beta-caryophyllene. Apply a drop or two to any painful areas. If you have sensitive skin, simply dilute one drop to 5 or 10 drops of a carrier oil like fractionated coconut oil or olive oil and apply. Repeat up to 3 or 4 times daily. The liver, along with its sidekick organ the gallbladder, is the main organ involved in fat digestion. Unfortunately, our move to foods containing harmful fats found in margarine, shortening or most commercial oils, place stress on the liver. Eliminate these foods or any foods made with them from your diet and instead choose preferable fats that include: cold-pressed oils, raw nuts and seeds, and avocado. Garlic improves the liver’s ability to lower cholesterol levels, making it essential if you have high cholesterol. Garlic’s natural sulfur compounds may be the effective ingredients that inhibit harmful liver enzymes and improve the way fats are metabolized in the liver. The limonene naturally found in lemon can boost your body’s production of glutathione—a critical nutrient in liver detoxification that helps ensure toxins are neutralized. Add fresh lemon juice to your water and grate some organic lemon rind into your cooking or baking. The fresh lemon rind adds a hint of fresh flavor to meals. 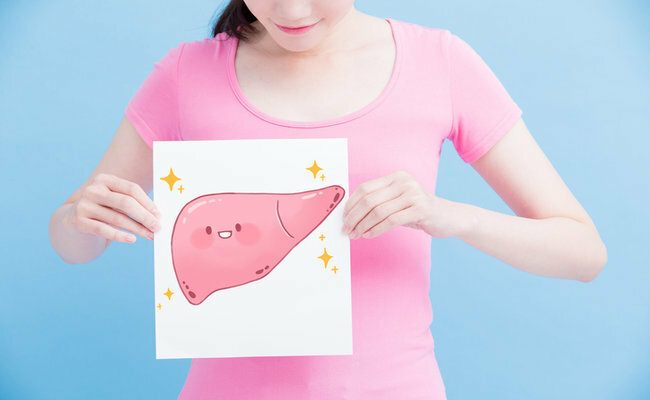 I’m talking about the delicious purple-colored vegetables that help to purify blood (one of the liver’s many functions) and contain liver-boosting betaine. Top salads with roasted beets, enjoy fresh borscht, grate raw beet over your salads, wraps or sandwiches. Excessive amounts of sugar in the diet can be harmful to the liver. By simply switching to the natural herbal sweetener stevia, you’ll reduce the risk of liver damage, including conditions like fatty liver disease linked to weight gain. Turmeric is a powerful natural anti-inflammatory that can help reduce liver inflammation and the weight gain or obesity that is often linked with it. Research in the journal Biofactors found that the spice alleviated the inflammation and helped to protect against some of the health-damaging effects of obesity.